A very cool and original sci-fi movie, this one is like The Fly meets 99 Homes, and deals with aliens in some very creative ways. Here’s a very entertaining and smart science fiction film that takes the idea of aliens coming down to earth and runs with it in ways we have never seen before. If Attack the Block got clever by putting the aliens in the projects, then District 9 blows the alien landing notion away. The aliens land in Africa and are forced to live in little shacks in the slums of town. When they are forced to relocate, the man who is the head of the relocation agency ingests an alien chemical and begins to turn into one of them. At that point you would expect the movie to become like The Fly, and be all about this character’s physical transformation. That’s when it goes in another direction and becomes about his escape. He does everything you could and also couldn’t imagine, including climbing inside of a giant robot and fighting off his enemies from in the robot’s armor. This is one of the coolest sci-fi movies around. District 9 is one of the most creative alien movies of all time. This is a film that imagines the aliens did come down in a flying saucer mothership, but other than that, everything is the exact opposite of what you would imagine. That includes the story, the characters, and especially the approach and style. This movie is meant to often feel like a documentary about malnourished aliens being housed in an internment zone and then being forced to evacuate and relocate. Not exactly what you would expect from an alien film. The movie stars Sharlto Copley as Wikus, a government agent tasked with helping get the aliens to relocate. At the start of the film, we see Wikus sitting at a desk, speaking to a camera in a documentary-style interview. He asks questions like whether or not he’s looking at the right place, and should be looking into the camera, and shares desk photos of him and his wife. From there, the documentary continues with interviews of multiple other people who talk about the day the aliens cane to earth and what happened. Thr ship landed above Johnasberg, Africa and just hovered there. It remained there for weeks with no movements. Finally scientists flew up in helicopters and forced their way in. They found a bunch of suffering, malnourished aliens in terrible shape. 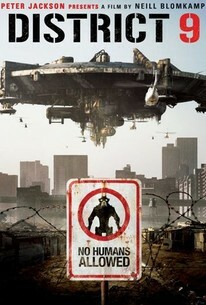 These aliens were brought down to earth, and District 9 was created as the area where the aliens could live. It was a slum. The only humans who lived anywhere near there were warlords and illegal arms dealing gangsters whose ambition was to eat the aliens and take on the alien souls. Crazy ideas, huh? But the movie jumps back and forth between the crazy and the ridiculously normal. So first we meet Wikus at his desk, then we learn the story about the aliens. Then we are back to the normal with human relationships and work place talk. Wikus’ wife’s father is the head of the agency where he works. This connection lands Wikus a major promotion where he becomes the head of the new department tasked with relocating the aliens. That brings Wikus out into the field, going door to door, trying to evict the aliens. He puts sticker posters on their doors, that the aliens don’t like, and he’s got a camera crew. Following him around. This is the movie continuing to give us that documentary feel. It’s like an episode of cops or an eviction reality show. If an alien refuses to leave, Wikus will go into the home and look for illegal substances to have the alien arrested and forced out. That’s exactly what leads him to find a canister, filled with some kind of mysterious poisonous gas. It sprays in Wikus’ face, and suddenly his nose starts bleeding black. Wikus goes home feeling terrible and steps through his front door, walking into a surprise party to celebrate his new promotion. This goes horribly wrong. Wikus ends up vomiting black blood on the cake and falling over. The next think you know he’s in the hospital. The hospital scene is fantastic. Wikus wakes up with a bandaged hand and pulls the bandages away to reveal a giant black claw. He starts screaming, naturally. Now, this is the kind of thing we’ve seen in other movies before, but it’s always a dream. It always happens just like this, as a quick flash of the character waking up, seeing something crazy on his body, freaking out, and then waking up in bed to realize it’s a dream. Only here, it’s not a dream, and that’s what makes the scene so great. Here we get to see the ending to that scene that, which is a “what if it’s not all just a dream?” Scenario. What if you now have to deal with having this claw for a hand? What would that mean? In this movie, what it means is that Wikus is now prime for experimentation. He’s the first ever human-alien hybrid, and the lab coats and weapons people can’t wait to get him on the table. First up is testing to see if his new hand can fire the alien weaponry that humans can’t use. It can. Wikus shoots animals with a gun that basically fires out a lightning bolt laser and shatters whatever’s in its path, instantaneously. Wikus objects to being used for experiments, and knows that things are only going to get worse for him. He knows there are people now who will continue to come after him, and so he runs away from it all. He runs off to join the aliens, and hideout with them. Only its not so easy to live among the aliens. For one thing, they are still living in the same area as those warlords who want to eat them, and these guys really want to eat Wikus’ hand. He turns to them for help, hoping they will give him some of those alien weapons to use, but they have other ideas in mind. Wikus has to deal with both these guys and also the government bag men who are coming for him. That’s when a very cool robot gets involved, and the movie suddenly takes on a new dimension in terms of cool technology and an awesome climax. Like director Neil Blomkamp’s third movie, Chappie, (District 9 was his first,) the cool robot at the end of the movie steals the show. But even before that, this was a pretty great film. It combined elements of the Fly with a documentary-style take on something like 99 Homes, about people being evicted. From the Fly, we get a movie about a character’s strange transformation into something unexplainable and grotesque. And the movie gets this whole story to feel like a documentary, and thus more believable and down to earth (no pun intended,) than the usual alien film. It does this by using not only interviews, but also footage from black and white security cameras whenever possible. The result is a very smart and unique alien movie.